This ruched top is one of my favorites to pair with a pair of pants or a skirt! Here's a look at what you'll find in store at Ann Taylor for Spring 2011. Expect to see a lot of neutral pieces including bronze, khaki and black, along with feminine prints in lilac and violet, with traditional navy and white. Love the shoes in the middle - can't wait for these to come out! Look out for more wedding dresses at anntaylor.com. These are my two favorites. The strapless silhouette is my favorite for a petite frame. 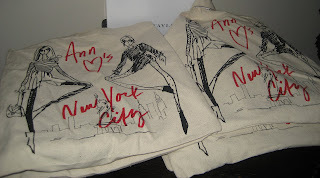 Guests received a special Ann Taylor tote bag with a necklace. I received the Statement Tassel Necklace, $68. Can't wait to see this in stores, very exciting! Thank you for sharing.